Rosemarie Wrigley, 65, was born on March 28, 1954 and she passed away on April 7, 2019. She is preceded in death by her parents Chancy & Carmen Young, her sister Ramona Baker & her brother Mike Young. 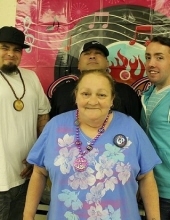 Rosemarie is survived by her sons Marc Young, Jerome Wrigley & Eric Wrigley. Sisters; Nancy, Patty & Stacy. Brothers; Chum & Tom. 9 grandchildren, 1 great grandson & a host of nieces and nephews. Rosemarie touched a lot of people’s hearts, she will be deeply missed by many. She was well known and respected. To send flowers or a remembrance gift to the family of Rosemarie Wrigley, please visit our Tribute Store. "Email Address" would like to share the life celebration of Rosemarie Wrigley. Click on the "link" to go to share a favorite memory or leave a condolence message for the family.